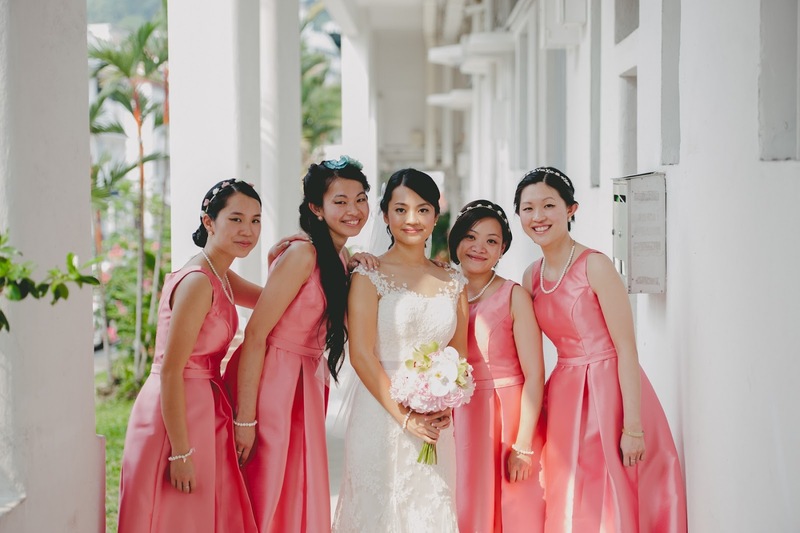 LookS: Vintage inspired 1950s bridesmaid...in pink style! Thankfully I think I have managed to style my 1950s bridesmaid look in a way that Audrey Hepburn might have been a little bit proud of....for starters, we gathered at a tailor's to puzzle together the design of a dress as a fully fledged chirpingly giddy bridal party....months before the wedding in Singapore. 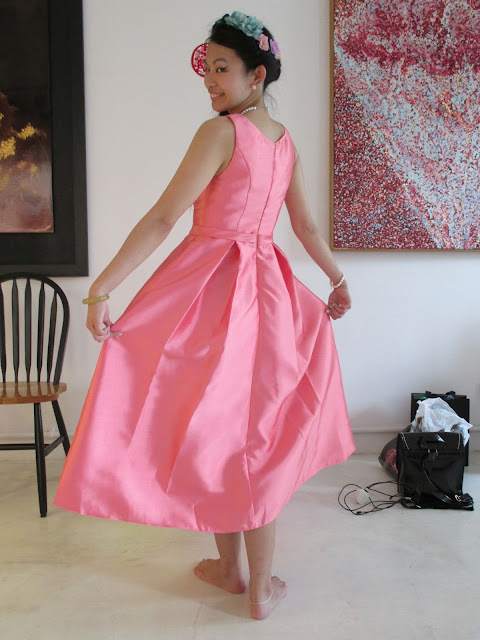 Choosing what was meant to be a boat neck, that somehow got turned into a crew neck by the tailor...the right shade of sweet enough pink with a slight coral undertone that then became more pink....the stiffness of the textured satin, the pleated and flared out asymmetrical non-straight hemline.....viola a bridesmaids dress design was born! 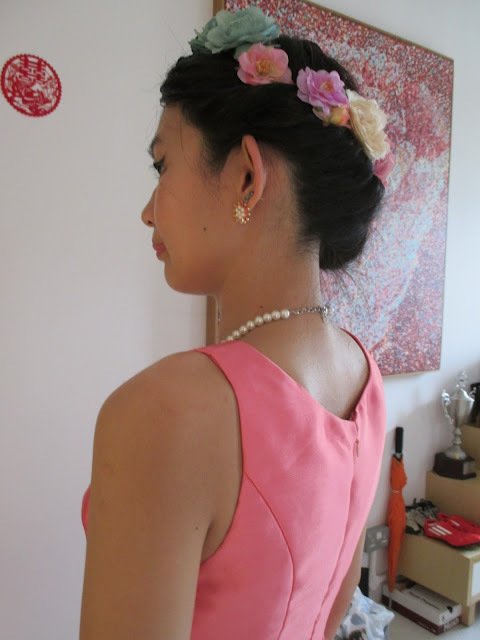 In true 1950s spirit there had to be pearls, but the test became the styling of hair. Not finding a flower garland I liked, I decided to bring all the flower clips I owned to piece together a make-shift flower circle across my hair....that is after rolling one side in a victory roll, rolling the other side down to a ponytail and forgetting hairspray when you wing it DIY style on holiday. Of course rocking up a true eyeliner flick to add some spice and choosing not to wear a petticoat in the over 30 degree celcius tropical heat. Frizzly hair galore or not, I was still as excited as ever and utterly beaming with joy....for I was to be bridesmaid at not just at any wedding, but at my dear sister Vicky's wedding! 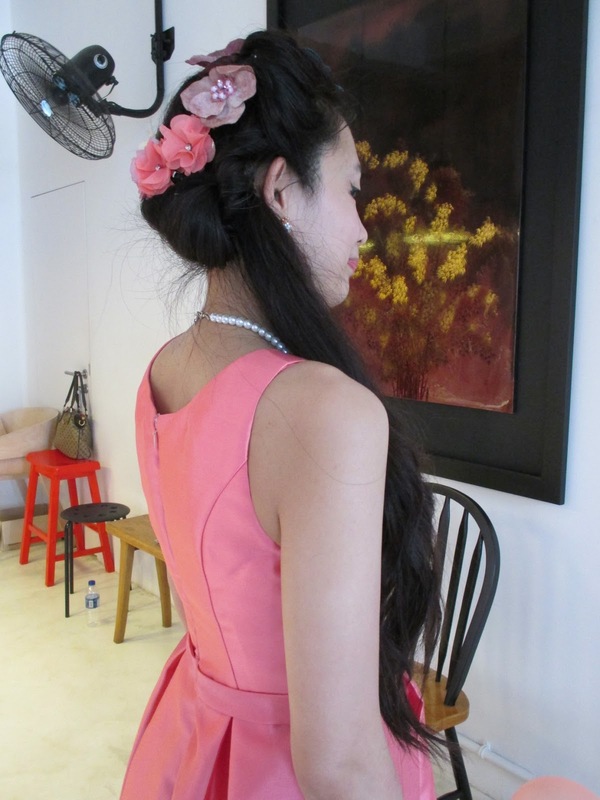 And it was a gloriously wonderful March day indeed. Perfect in every way because of every smile and every chuckle of laughter....and that's as much as you will get from me, as I can't divulge too much on details, it is after all a very family orientated day. But I can confirm that there was ice cream, cake, flowers and lots of very happy tears. Now...I shall be off to Seattle for a little spiritual two week trip....in the meantime have an absolutely fabulous start of September darlings! Absolutely gorgeous! 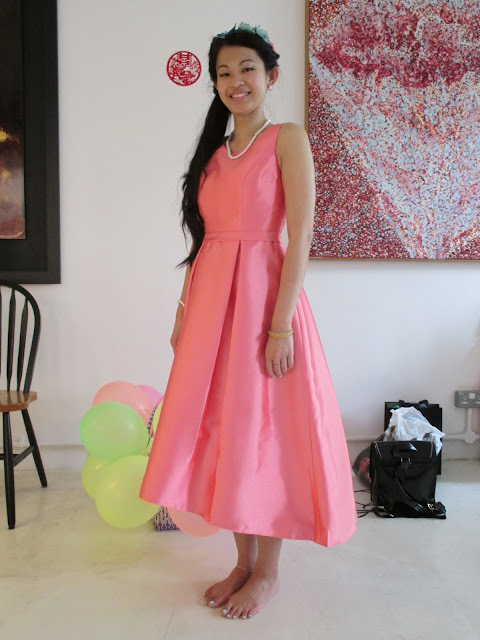 From the classic tea length to the cheerful, punchy pink hue, this dress is radiantly lovely on you, sweet May.